With some mellowcreme Easter bunnies (and chicks and so on) and some Easter themed sprinkles, you can make classy, quick Easter cupcakes that make great favors or centerpieces. 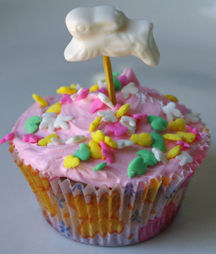 What You Need: 1 cupcake; pink frosting; Easter sprinkles (I used bunny shapes); toothpick; mellowcreme candy bunny. How to Make It: Frost cupcake pink and sprinkle with Easter sprinkles. Impale rabbit with toothpick (ouch!) and stick in center of cupcake. You could also add a guest’s name to a piece of paper around the pick. This entry was posted on Thursday, April 9th, 2009 at 2:20 pm	and is filed under animal cupcakes, Easter cupcakes. You can follow any responses to this entry through the RSS 2.0 feed. Responses are currently closed, but you can trackback from your own site.